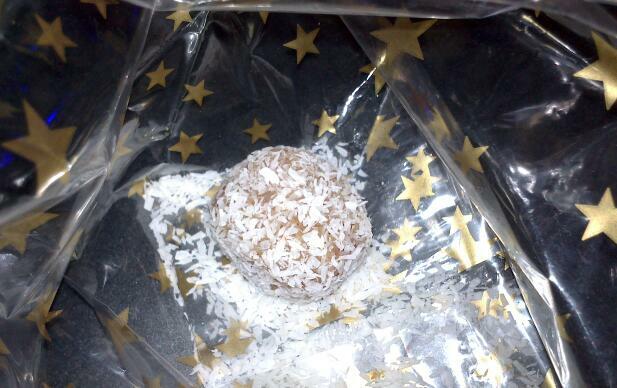 Shortie but Goodie: Coconut Snowballs – Yours Julie – Mostly travel, also food. When I made the dough, I was a bit underwhelmed, because the coconut taste didn’t come through at all. My taste-tester and baker’s little helper said the same, so we had to do something about that. Of course we were doing this on a Sunday, when all the shops in Germany are closed, so I had to make do with what I had and amped it up with some almond, sugar and Amaretto. This is my updated recipe (and there is a funny video at the bottom). No food processor: Pour coconut meal into a wide bowl, add the rest as described below and mix well with a fork. Add ground almonds, maple syrup, coconut milk, vanilla, cinnamon, and salt and process until well combined. Do a taste test and see if anything is missing. The mixture should be sticky, but hold its shape. Add more shredded coconut or if it is too soft, if it is too dry add more coconut milk or Amaretto. Shape the mixture into 1,5 – 2 cm balls and coat with the remaining shredded coconut. Refrigerate for at least an hour and freeze for later, or keep in the fridge and eat within 5 days. Bring to room temperature before eating for best taste.